Many vehicle drivers carry automobile insurance, and after a collision, victims may seek compensation from the driver at fault. In certain situations, the injured person may pursue an uninsured motorist claim to recover his or her costs and losses. Car accident lawyer M. Jeanne Trott can guide New Hampshire residents through the process of seeking the compensation that they deserve. Since collisions often result in serious and complex medical conditions, clients benefit from her experience as a registered nurse in acute care trauma. Ms. Trott also brings over 25 years of legal experience to her representation of car accident victims. The immediate period following a car accident is often traumatic and stressful. Frequently it is necessary to preserve evidence and take immediate action to preserve your legal rights. During your free consultation, you will meet directly with Attorney M. Jeanne Trott regarding your claim. Contact us at 603-624-7500 to discuss your claim and arrange a free consultation. In New Hampshire, motorists are not required to carry auto insurance. If an uninsured motorist is at fault for your injuries, you may be able to recover through your own insurance coverage. In addition, legal remedies may be available, including a personal injury lawsuit against the uninsured motorist, if he or she is at fault for the accident. Most car crashes involve unintentional conduct, which usually means that the injured person brings a lawsuit based on the theory of negligence. The question before the court is whether the defendant breached a duty of care owed to the victim, and whether that breach resulted in the accident and related damages. Drivers are expected to operate their vehicles with reasonable care, especially since handling a car is an activity that may foreseeably pose risks to others. To show that a driver was negligent, the first step is to show that he or she owed a duty of care to the accident victim. Next, the task would be to show that the driver breached this duty of care through some negligent conduct, such as driving too fast for conditions or violating a traffic rule. The elements of causation and damages relate to the sequence of events that ensued, leading from the breach to the crash in which the victim was hurt. Damages in a car accident lawsuit may serve to offset economic expenses, such as medical care, as well as other, non-economic losses, including pain and suffering. Hospital bills and wages from missed work should be documented carefully. 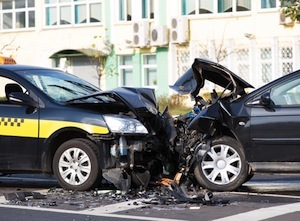 Property damage and repairs to a vehicle are also commonly sought in a car accident lawsuit. Another factor to consider in a New Hampshire personal injury case is comparative negligence. State law recognizes that more than one person may be responsible for an accident. Under the comparative negligence rule, an injured person can collect damages from a defendant who is found to be at fault as long as the victim was 50% or less responsible for the accident. Injury lawyer M. Jeanne Trott can assist individuals in the Manchester area and elsewhere in New Hampshire with asserting their rights after a car crash. She provides compassionate and capable legal representation throughout all phases of a case. Contact the office today at (603) 624-7500 or complete our online form to set up a free consultation. We also represent clients in communities such as Bedford, Auburn, Hooksett, and Candia.